With one of the largest population in the European countries, Germany's smoking population is second to U.K. Leading e-cigarette brands from U.S., China, and Europe have realized the potential of this budding industry and have penetrated the market to leverage the opportunity presented by a large consumer base. Vape shops numbers are increasing across the country and new products and flavors have been launched in the market to streamline and enrich the experience of e-cigarette smoking among the consumers. According to 6Wresearch, Germany E-cigarette market size is projected to reach over $852 million by 2023. Tobacco sales continue to fall as more and more number of ex-smokers are looking forward to these devices as a tool for smoking cessation. Market players in partnership with local distributors are investing profoundly and are stepping up to educate the end-users, both online and at vaping exhibitions, organizing competitions and expanding their product portfolio for third generation e-cigarette devices. Modular e-cigarettes, owing to their higher flexibility of providing customization, captured the highest Germany E-cigarette market share in 2016. Recent advances in modular e-cigarette devices, for instance, incorporation of larger, rechargeable batteries of more power, e-liquid tank refilled through standard or personalised mixtures, coil upgrades and variable as well as controllable power options have further resulted in healthy adoption of these devices among the end-users. 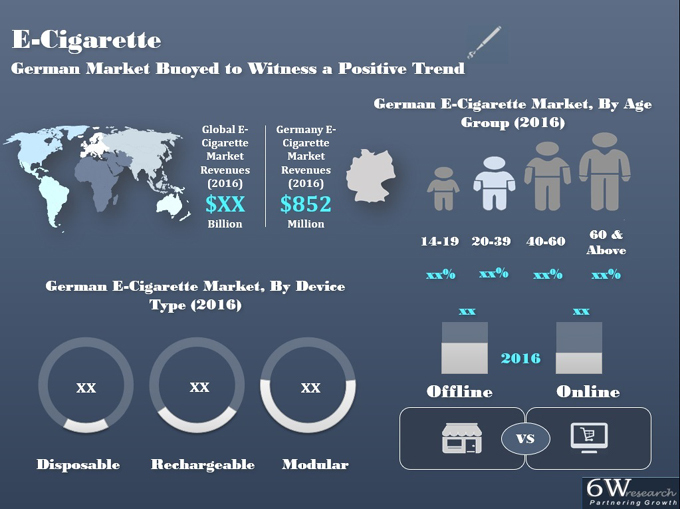 Key vendors in Germany E-Cigarette Market include – British American Tobacco (Germany) GmbH, Joyetech Deutschland GmbH, NJOY, Inc., Philip Morris GmbH, Red Kiwi GmbH, Shenzhen Innokin Technology Co., Ltd., Smok Technology Co. Ltd., and SNOKE GmbH & Co. KG. The Germany E-cigarette market report thoroughly covers the e-cigarette market by revenue by device type and demography. The Germany E-cigarette market outlook report provides an unbiased and detailed analysis of the Germany E-cigarette market trends, opportunities/high growth areas, market drivers, which would help the stakeholders to decide and align their market strategies according to the current and future market dynamics. 11.2	Shenzhen Innokin Technology Co., Ltd.
11.7	Smok Technology Co. Ltd.
11.8	SNOKE GmbH & Co. KG.